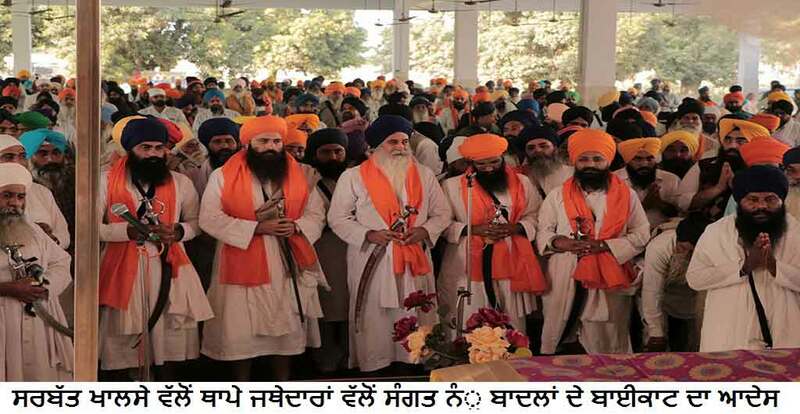 RAJASTHAN, India—The organizers of Sarbat Khalsa 2016 along with Sarbat Khalsa appointed Jathedars today held a meeting of Sikh activists at Gurdwara Budha Johad in Rajasthan. The meeting concluded with decision to politically boycott Punjab Chief Minister Parkash Badal and Deputy Chief Minister Sukhbir Badal. Bhai Papalpreet Singh, a prominent Sikh activist based in Tarn Taran area was deeply upset by recent incidents in Punjab as the State Government had banned the gathering of Sikhs to be held on November 10 at Talwandi Sabo. While starting the meeting, Bhai Papalpreet Singh demanded that the Jathedars ought to take a clear stand about Badals. “Badal clan is enemy of Sikh Panth and an enemy needs to be tackled like an enemy,” he added. Witnessing great uproar within the Sikh Sangat, Jathedar of Takht Sri Kesgarh Sahib Bhai Amrik Singh Ajnala and Jathedar of Takht Sri Damdama Sahib Bhai Baljit Singh Daduwal resolved to issue Hukamnama asking for political boycott of the Badal family. Later, in a Hukamnama signed by Jathedar Amrik Singh Ajnala, Bhai Baljit Singh Daduwal, Bhai Major Singh, Bhai Jagmeet Singh and Bhai Suba Singh, the Sikh community was directed to politically boycott Badals and make them oust from Punjab polity. The Jathedars have also stated that the next date and venue of Sarbat Khalsa will be announced as per directions by Akal Takht Jathedar Jagtar Singh Hawara and Interim Akal Takht Jathedar Bhai Dhian Singh Mand.